else about him. Well I know a tad more. Perhaps this brief recollection will interest you. he was a "professional Italian", by which I mean one that reveled in his ancestry, and was a proud North Ender. feast when brought to the table. 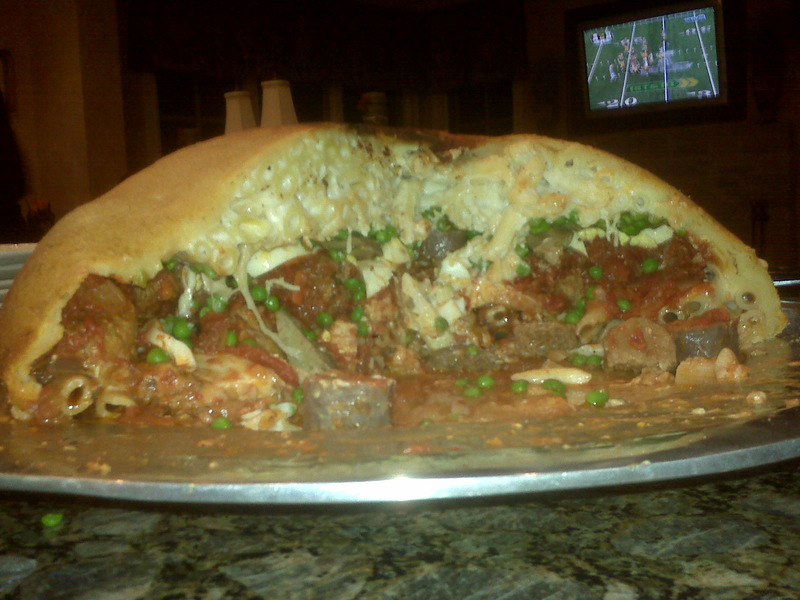 or--at a minimum--a hearty round of applause when you bring the Timpano to the table. I must give credit where credit is due. And I must confess that I don't bake. this part of the recipe. by all means use it here. spuntature e fagioli, pork ribs and beans. cool, cut them in fourths and reserve. 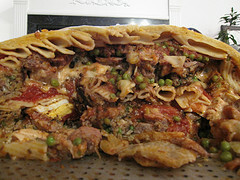 the crust will need to rest in the refrigerator for at least one hour. until a ball forms and just begins to clean the sides of the bowl. six seconds to recombine the mixture. If the dough seems too dry, add 1 - 2 Tbs. ice water and do the same. Parmigiano. Season with a little salt & pepper. wind up with seven to nine, depending on how large I make the first few. and saute all over, regulating the heat if necessary to avoid excessive spattering. The meatballs are done when they're brown all over, and have a slight crust. Remove, drain on paper towels and reserve. the pan occasionally, until they're wilted; about four or five minutes. and cook, swirling the pan from time to time, until the flames have subsided. Remove the chicken livers and reserve with their sauce. edges of the chicken breast begin to whiten. Turn the breasts over and repeat. the liquid to bubble until it has reduced to approximately two to three tablespoons. Remove the breasts and reserve with their sauce. larger than the other. Return the smaller portion to the refrigerator befor proceeding. 14 or 15 inches in diameter by 1/4 inch thick. at the top of the pan, cover loosely with plastic wrap and refrigerate. cover loosley with plastic wrap and return to the refrigerator. Pre-heat the oven to 350 f., and bring a large pot of water to the boil for the pasta. Cook the penne (or ziti) until al dente, drain in a collander and reserve. necessary for the final assembly. breasts and chicken livers over the pasta before sealing with the top crust. 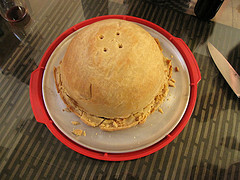 place in the center of the pre-heated oven and bake for approximately 40 minutes. heated, and the cheese melted. serve at the table. Be gracious when the guests applaud. You are an inspiration to all aspiring cooks...thank you. 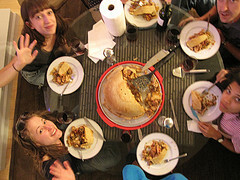 who fed a group at her 2011 Superbowl Party. A smash hit to say the least.